The Federal Bureau of Prisons, also known as the BOP, is a federal law enforcement agency and a division of the United States Department of Justice. The BOP is responsible for the incarceration and housing of federal inmates and those sentenced to terms in federal prisons. The BOP currently houses approximate 200,000 inmates at 120 prison facilities throughout the United States. Inmates are designated to institutions based on their custody and security levels as determined by their criminal history, the length of their sentence, and severity of their crimes. Inmates serving less than 10 years with no criminal history can be assigned to minimum security prison camps, with those serving 10 to 20 years going to low security Federal Correctional Institutes (FCI) and those serving over 20 years being designated to a medium security institution (FCI) or High Security United States Penitentiary (USP). Inmates being held in a pretrial – presentence status can be held in Metropolitan Detention Centers located at MDC Los Angeles, MDC Brooklyn and MDC Guaynabo, or Metropolitan Correctional Centers located at MCC New York, MCC Chicago and MCC San Diego. Federal Detention Centers for pretrial inmates are located at FDC Miami, FDC SeaTac, FDC Philadelphia, FDC Honolulu, and FDC Houston. It is suggested that inmates at these facilities contact Pacific Telephone company at 866-966-8655 to lower the cost of calling home. Federal Inmates in the BOP are allowed phone privileges of 300 minutes per month from January thru November, and 400 minutes in November & December. Each call is limited to 15 minutes. Phone rates are 21 cents per minute for calls outside the local calling area with 15 minute calls costing $3.15. Pacific Telephone Company has set up a discount calling plan where they can lower the cost of 15 inmate calls to a low as $1.65, or 11 cents per minute. To obtain discount calls from Pacific Telephone call: 866-966-8655 or visit the Pacific Telephone Federal Inmate Calling service on the web at www.federalinmatecalling.com. 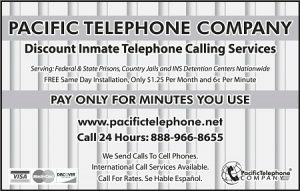 Pacific Telephone offers federal inmates and their families several calling plans to save them money on the expensive cost of federal prison calls. The Unites States Department of Justice is headed up by the Attorney General of the United States in Washington DC and prosecutes those charged with violating crimes against the Unites States Criminal Code. In each of the 98 Federal Districts in the United States, the U.S. Attorney’s Office a branch of the U.S. DOJ prosecutes the case in the U.S. District Court System also known as the Federal Court System. The U.S. Attorneys also known as Federal Prosecutors are appointed by the President of the United States as the chief federal law enforcement officer for their district. They assisted in trying cases by staff of government lawyers called Assistant United States Attorney’s filing the role as prosecutors. Many states such as Nevada and Arizona may only have 1 Federal District, where larger populated states such as California, Texas and New York are broke in multiple Districts. Each Federal District is assigned jurisdiction over several counties within the state and has one or more Federal Courthouses also known as U.S. District Courthouses that serve the U.S. District Court where they are located. The Federal judges that Preside over the district courts carry the formal title of U.S. District Judge and Magistrate Judge, each holding a different authority. The District Judges also called Article III judges are nominated by the President and are confirmed by the U.S. Congress and Senate. They hold lifetime appointments and perform judicial duties holding civil trials, criminal trials, sentencing and the issuance of Federal Injunctions. U.S. Magistrate Judges are appointed for eight years by a majority vote of the Article III Judges in their District and can issue search and arrest warrants, hold criminal arraignment proceedings, detention hearings, bail hearings and preside over misdemeanor trials civil trials.